Richard has been a full-time author for thirteen years, after finishing his first novel at the age of forty-five (!) He lives near Wollongong, south of Sydney, between golden beaches, green escarpment and the biggest steelworks in the southern hemisphere. He has collected six Aurealis Awards in Australia and the Tam-Tam Je Bouquine award in France. His short stories have appeared in three major American anthologies: Year’s Best Fantasy #9, Best Horror of the Year #3, and Ghosts by Gaslight. His novels have spanned adult, YA and children’s, and fantasy, horror and science fiction. His fifteenth novel, the steampunk fantasy Worldshaker, came out in Australia, US, UK, France, Germany and Brazil. 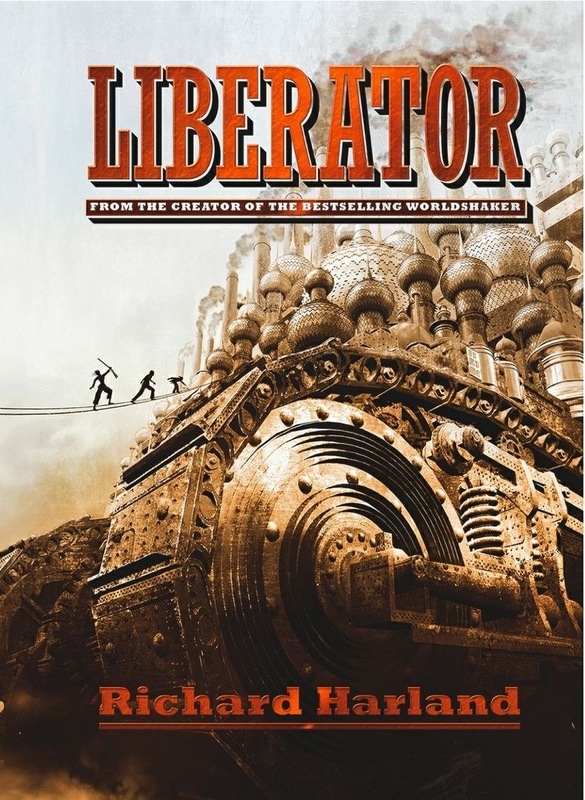 The sequel, Liberator, came out in Australia, UK, France and Germany in 2011, and in the US earlier this year. He’s now finishing off another steampunk novel, set in the same world, to be published by Allen & Unwin in March 2012. Richard’s author website is at www.richardharland.net. He has also put up free guide to writing speculative fiction, a website as big as a small book, at www.writingtips.com.au. You recently appeared at the Gold Coast Supanova Pop Culture Expo, and it looks like you had a blast! Did you find it a different experience than other conventions you have been to in Australia? How does the culture compare to, say, a Swancon or a Continuum? Different sort of beastie! Supanova at the Gold Coast meant thousands of people, many of them dressed in fabulous costumes, so much buzz and so much fun. I found it really exciting! What it didn’t have was the sense of community you get at a Continuum or a Swancon – the pleasure of chewing the cud with old friends. Supanova closes down when the ‘show’ closes down; there are cocktail parties and such for the special guests, but no general get-together. With the traditional type of con, what happens outside the formal events is often the best part of it. Leaving your career as a university lecturer must have felt like a bit of a risk at the time. Was there a point where you really wondered whether you had made the right decision? And was there a watershed moment where you felt that yes, you had made it as a full time writer? Leaving my uni career was like walking off the edge of a cliff. I had tenure, it was a job I loved, and I knew I could never get back because at that time English departments were making up for past bias and hiring almost all women lecturers. I regretted it at first because I felt pushed out when I wasn’t allowed to reduce my uni workload and run with both careers at the same time. But I soon realised that I wouldn’t have had time to run witan with careers anyway, and that it would have been so much harder to resign from uni if they’d been nice to me – well, then it all seemed fated in the stars. I’ve never had any regrets since – for better or worse, I feel like I’m doing what I was born to do! There was a moment when I believed I’d made it – and of course I was totally wrong. I’d had my first SF novel, The Dark Edge, published by Pan Macmillan, and I was roaring through the sequel – no more problems with writer’s block. I remember walking around floating on air, with the wonderful feeling that the whole world loved me. Then my editors read my first draft of the sequel and they didn’t love me – or it. Wholescale revisions requested! I came down to earth with a bump. I’ve been up and down many times since then. Soar and plummet, soar and plummet – you never find this out about writers because we have to keep talking ourselves up, but it’s the common experience of almost every professional writer I know. Nobody ever makes it permanently! Steampunk doesn’t show any signs of diminishing in popularity, but are there any challenges it faces to maintain its momentum? Are there new places for it go, and do you have any new concepts that you are planning to explore in future books? I could tell you what I’m doing in my next books, but then I’d have to kill you … along with all the other people who read this interview! I think steampunk is just starting to hit its straps. It’ll really take off with some of the movies currently being made or planned – because one thing about steampunk is that it offers the opportunities for the most stunning visual imagery. Challenges? I suppose steampunk could get sidetracked into becoming merely a light, whimsical sub-genre of Spec Fic, I see it as much bigger than that, as the genre for imagining worlds that might have been – without the limitations of medievalism and Tolkienesque tropes. The possibilities are as broad as Spec Fic itself, and the main challenge is not to get channelled into one narrow rut. Yes, airships could become the new dragons … but we must never let it happen! My reading has been restricted lately, because I had a cataract operation and had to wait ages to be tested for new reading glasses. For two months, I’ve been on a diet of audio books, so I haven’t read much recent Aussie fiction. Immediately before reading Sea-Hearts, I read a whole smorgasbord of fiction by Australian Spec Fic authors, namely the latest manuscripts by the ROR group of authors (including Margo, and Rowena Cory Daniells, Tansy Raynor Roberts, Maxine MacArthur and Dirk Flinthart). There’s going to be some great books coming your way from those guys! But my lips are sealed by the ROR oath of secrecy (and the horrible mutilations prescribed for oath-breakers). I tend to see things from a writer’s perspective. An amazing number of Spec Fic writers I know have managed to get their first novels published over the last 2-3 years. It’s only anecdotal, and maybe it’s just an accident of my friends, but I suspect Australian publishers are giving new authors a go like never before. The flip side of the coin is that they’re not putting in any more promotion or publicity … as per Spaghetti Theory: you throw a plateful of stuff against a wall and see what sticks. For short story publication, well, the anthology model has now largely taken over from the magazine model. The big positive in Australia is that our anthologies tend to be broad spectrum rather than pinned to a niche readership or straitjacket theme. At the moment, WA is clearly the hub of the universe, with Ticonderoga and Twelfth Planets Press. This entry was posted in Writing and tagged 2012snapshot, interviews, Richard HArland on June 2, 2012 by David.